A small part of my store inventory comes from purchases from other online sellers. If I think their price for an item leaves a lot of “meat on the bone,” I’ll buy it. And I have done pretty well on some pieces. But every once in a while in my searches I come across a “crazy listing” and I have to share this one! Yesterday I was poking around eBay in the “jewelry lots” and found this listing for a full jewelry box that started at $6,500! 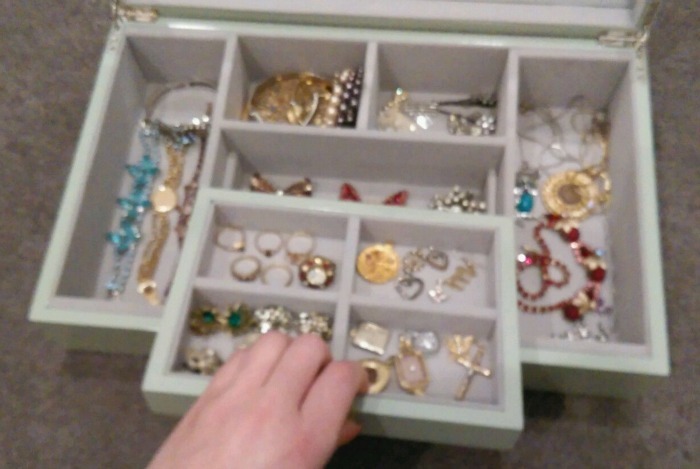 Good grief…what the heck is in this jewelry box?! I had to look! I was expecting to see lots of real gold pieces, possibly encrusted with real gems, maybe some quality watches. You know, really nice bits. Here’s what I saw…blurry photos, not one closeup and most pieces looking like costume jewelry. So I scrolled down to the description area expecting to see all the details about every piece. But, alas, it was missing. The seller alludes to some pieces with diamonds and emeralds, but shows no photos and gives no details. Well, all I can say is good luck. I hope she is able to get that safe, warm house, but I doubt this listing is going to be of any help. How about you? Have you ever run across a listing that was downright crazy? it would be nice to know the ‘backstory’ about this listing, and the outcome!!!! I’m sorry but this listing is laughable to me. I admit I haven’t been on ebay in a while but I do see outrageous prices for some things on there. I don’t buy her house story either but I would probably give her the benefit of the doubt. You never know other people’s situations. Still $6500 is crazy for this lot. I do wonder about the house story too…but even if it’s true, why should anybody pay $6500 for this lot?? You don’t even know what’s really in it! This one still has me shaking me head! !